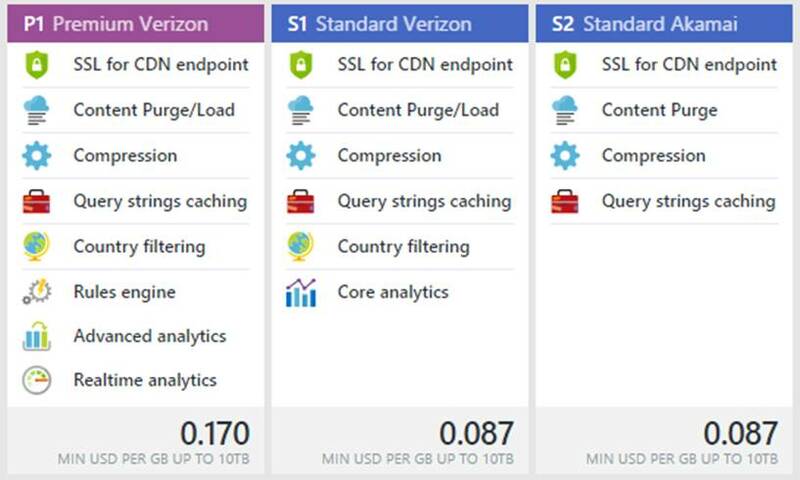 We announced the general availability of Azure CDN from Akamai last week. Check out some of the highlights from this release below. Which CDN provider I should choose to deliver my content? There are a couple considerations you want to make when choosing a provider, including performance, features, cost, etc. Both providers have distinct ways of building their infrastructures and support different feature capabilities. We recommend customers to focus on features and end-user performance. You always should test the provider performance for your scenario. Do I need only one provider or should I use multiple providers? CDN providers have different coverage, performance in different regions and various feature capabilities. Based on your requirement you can use one or multiple providers. When using multiple providers, you can add a traffic manager solution to load balance between providers based on best performance, cost, etc. There are different pricing tiers and features between two providers, what's the long term goal? Our goal is to align the features across providers for the same pricing tier. Akamai premium is in the roadmap. We are constantly working on adding new feature capabilities to both providers. What features does each provider have? Please read our overview documentation with detailed feature comparison. You can also go to our UserVoice forum to request or vote for feature you’d like to see.